Tripp Lite's C14-to-C15 power cord allows connection from high voltage network hardware utilizing C15 type connectors to PDUs and UPS systems with C14 type inputs. Heavy-duty 14 AWG wire supports voltages up to 250 V. Molded ends ensure a lifetime of use. Don't settle for less than the best—enjoy superior Tripp Lite quality! The P018-003 3-ft. 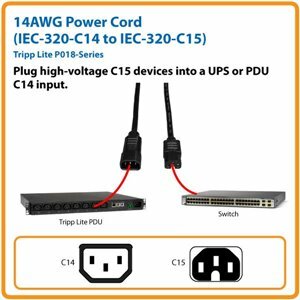 Heavy-Duty 14AWG Power Cordis an ideal solution for connecting any server or networking device with a C15 plug into a PDU or UPS with C14-type inputs. Unlike cut-price power cords, the P018-003 is manufactured to exacting specifications, using superior materials, for reliable performance and long life. For peace of mind, the P018-003 comes with a lifetime product warranty and is RoHS-compliant. Tripp Lite's P018-003 cable features a C14 receptacle on one end and a C15 connector on the other end. This enables users to connect Cisco, HP and other network hardware with C15 power connections, such as servers and storage drives, to UPS systems and PDUs with C14-type inputs. Simply connect the C15 receptacle into a device and plug the C14 connector into the UPS or PDU outlet. The P018-003 is manufactured using superior materials and is tested to UL standards 62 and 817 for optimal product safety. The high-quality connectors are designed for reliable service and long life. We're so confident of the quality of our P018-003 Heavy-Duty 14AWG Power Cord that we warrant it to be free from defects in material and workmanship—for life! As part of Tripp Lite's commitment to environmental responsibility, the P018-003 minimizes the use of hazardous materials and meets strict RoHS specifications. Founded in 1922 in Chicago, Illinois, Tripp Lite is a leading manufacturer of products to power, protect, manage, house, cool, connect and mount your equipment. From the largest data center to the smallest home office, Tripp Lite products keep your equipment running effectively and efficiently. Whether you need to supply power to servers and have reliable battery backup, connect high-resolution video sources to displays and digital signs, or organize and secure IT equipment in rack enclosures, Tripp Lite has the complete solution. Plus, before and after your purchase, our Chicago-based, in-house technical support specialists are available to assist you by phone, email and live chat. With over 90 years of quality products and service, Tripp Lite is a brand you can trust.